Navigate to Pages > Add New, in your WordPress dashboard. In the screen that comes, title your page as Blog, and scroll down to find the Page Attributes metabox. In Page Attributes, click on theTemplate option and pick either Blog template or Blog template with large images, based on your preference. Publish the page, and now you can use this page as your Blog page. Add logo – Your theme recommends a logo size of 177 × 40 pixels. By default, your “Header Menu” is fixed and visible. You can check the “Header visibility” button and the header will toggle on front-page. The Colors section gives you full control over the color scheme for your text, title, and header text. To do that, you must select the colors you want right from the Customizer, in the Colors tab. For more color options, such as color scheme, check out Parallax One Plus add-on. Add new image – If you want to crop the images added by clicking the “Add new” button, keep in mind that your theme recommends a header size of 1500 × 1019 pixels. Add new image – In the Content options, you can add your second logo, which will appear above the title. In the same section, you can add the title, the subtitle, and a button link. Need more options? Parallax One Plus allows you to choose between two different header designs, and has tons of other features, such as shortcode section, Portfolio section and more. This section is placed immediately below the header image. You can add as many logos as you want. Parallax One has a stunning Parallax effect feature. This feature will appear in your “Header” section. Drag and drop your image here or click on the Select Image button to add it in the classic mode, from your computer. You can either upload an image from your computer, or you can pick a photo already uploaded – which can be found in the Media Library. !important – You must add two images to activate the parallax effect and check the box “Use parallax effect”. Parallax One includes a Services section. Here you can edit the title, the subtitle, and also add how many services boxes you need. A Service Box contains an icon (image), a title, and the text. !Important The Image type box allows you to choose the icon and the image alone, or none (only the text will show up). If you choose to use an image, please make sure that you selected “Parallax One Services” size from Attachment Display Settings before you clicked on “Insert into post” button. About section – You can add a picture that fits your business. You can add here important details like a title and your wonderful story as well. Parallax One includes a Team section. Here you can edit the title, the subtitle, and also add each member of your team. A Team member box contains an image, a title, and a subtitle. !Important Please make sure that you selected “Parallax One Team Member” size from Attachment Display Settings before you clicked on “Insert into post” button. Parallax One includes another important section: Testimonials. Here you can edit the title, the subtitle, and also add how many testimonials you need. A Testimonial box contains an image, a title, and a subtitle. !Important Please make sure that you selected “Parallax One Testimonials” size from Attachment Display Settings before you clicked on “Insert into post” button. Ribbon – You have the option to add a ribbon. A ribbon contains the title, a button, and a button link. Parallax One has a Latest News section, which will display the latest posts from your blog page. This way, you can keep your users updated. You can also change the title and choose how many posts to appear (Settings -> Reading -> Post per page). In Contact section, which is placed under the Latest News section, you can add how many fields you need and your Map Shortcode. A new field contains an icon, a text, and a link. We recommend you to install Intergeo Maps plugin that perfectly suits this section. A Social icons section where you can add all your social accounts. The theme supports almost all social networks in the world. Also, from the Appearance->Menu, you can add pages to your menu that will be displayed into your footer. Site Title – Add the site title. Tagline – A short description of the site. 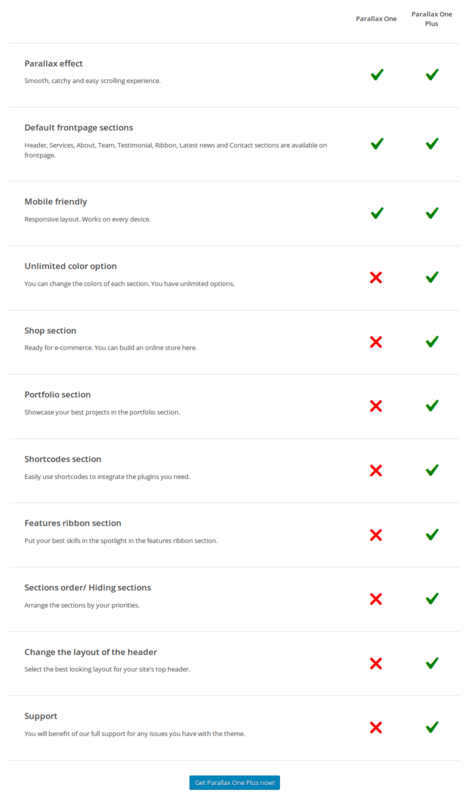 Front page displays – Your theme supports a static front page. !Important In “Front page displays” you must have checked “Your latest posts”. Only then the Front-Page will display properly. Parallax One supports one menu. Also, in this section you can disable the preloader with a simple click. Add a Widget – Add a widget as simple as in the left picture. You have the ability to add how many widgets you want. You can add your Contact form shortcode and the Map shortcode right from Customize. It’s important to know that you have to access the Contact page when you are in the Customizer, so you can do these changes. In this demo, we used Contact Form 7 plugin to create the contact form. For the Map shortcode, we used Intergeo Maps plugin. Still not convinced? Check out this showcase with beautiful websites designed with Parallax One: A SHOWCASE GALLERY OF AWESOME USER SITES BUILT WITH IT.